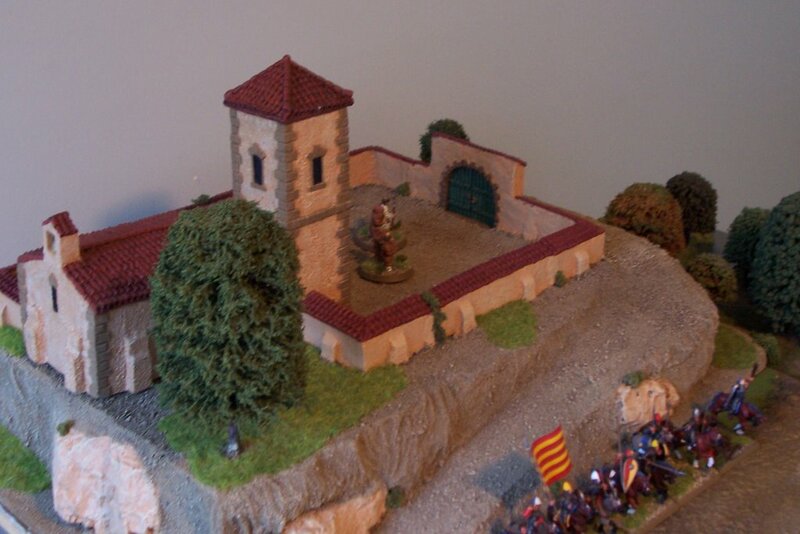 Finally got around to completing the Spanish church I bought from the Essex Miniatures factory in 1996 (Hovels Ltd resin). I had painted the church and steeple straight away but it has taken me 10 years to paint the walls and make a hill to put it on. I can use it as a great centre piece for my El Cid and Andalusian armies, Napoleonic Spain (when I paint them again), Mexico (Mexican American war and Maximiliian) and Italy (Italian Wars, Napoleonics and the war of 1859). 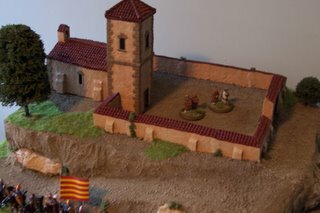 The church and steeple are removable so that I can place a small Greeco/Roman style temple in its place when I play ancients (when I finish it of course). Not exactly accurate for those purist but close enough for me and thats the important thing. Talking about Italy, Andrew Parr whose very nice Republican army you see here has sent me his Italian Wars adaptions for WAB 'Armies of Chivalry'. I have always been interested in the Swiss, French, Spanish, Italian and Landsknecht troop types but I have felt that until I can paint and do those French Gendarmes justice I would steer clear of the period. Andrew's adaptions have gotten me very interested as he has added lots of campaign, battle and period strategms that seem to give the period something special that it deserves. I might have start this sooner that I thought, for those who need wargaming inspiration have a look at the Spanish Wargaming magizine 'Soldiers and Strategy' which had a special on Pavia (issue 8 I think). The magazine had some very very nicely painted Redoubt Miniatures, which still makes me think I need a few more years painting experience. When the Miniature Wargames magazine first started they would always have some great pictures of Peter Gilder's immense Italian Wars collection, so I blame Peter for this interest wargaming interest as well as the Sudan and Napoleonics in the Grand Manner (bless him). Andrew has also prompted me to have a more detailed look at some of these things that I feel needed to be added to the WECW lists that I have written. Nice scenery Scott. Must be a joy to play games on. Sorry Scott, I'm not Jeff Jonas, just Jonas. Still thing your scenery piece is great though. The wooden fortress sounds really nice. Sounds like it would be good for some dark age gaming too. Hi Scott, yes that's me. I haven't had time to get in touch in with Andreas yet, as almost all the time I have rigth now is taken up with writing frantically. My dissertation is due in just three weeks now, and there is still quite a lot of work left. I am looking forward to a bit of leisure time in November and December, though, so I will definitely try to get in touch with Andreas then. I've been looking at your blog and getting very inspired. It's going to be hard to pick just one army, and I fear that I will end up with several half-finished projects.